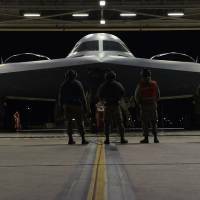 The U.S. military sent a nuclear-capable B-2 stealth bomber from Whiteman Air Force Base in Missouri on a long-range mission to the Pacific area of operations over the weekend, it said Sunday, a day after Pentagon chief Jim Mattis highlighted rival North Korea’s “accelerating” atomic weapons program during a visit to South Korea. 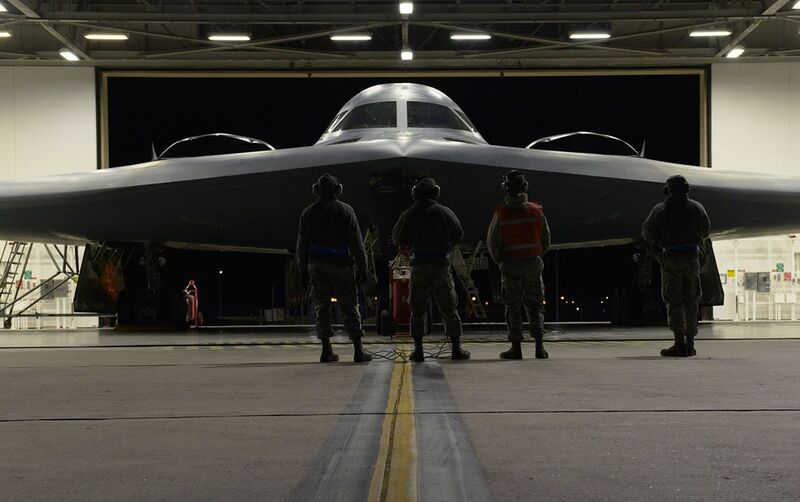 The flight path of the B-2 was unclear, and Strategic Command did not respond to a request for comment, but the last time one of the stealth bombers flew near the Koreas was during a rare show of force over the peninsula in 2013. Military experts say that any U.S. strike on North Korea would almost certainly involve the powerful bombers. On Sunday, South Korea’s Yonhap news agency reported that Seoul had signaled its intent to offer maintenance support for U.S. strategic military assets to be deployed there on a rotational basis in time of need, citing an anonymous government source. The weekend flight of the B-2, which can carry conventional as well as nuclear bombs, comes just ahead of Trump’s Asia tour, which is scheduled to kick off with a visit to Japan between Nov. 5-7. That visit will include talks with Prime Minister Shinzo Abe that are expected to focus on the North Korean nuclear crisis. The North has made a series of breakthroughs in its nuclear and missile programs this year, conducting its sixth and most powerful nuclear test early last month and twice test-firing an intercontinental ballistic missile in July that experts say is capable of striking a large chunk of the U.S.
On Saturday Mattis blasted North Korea for “outlaw” behavior and vowed that the U.S. would never accept a nuclear North. In recent months, the North has also lobbed two missiles — believed capable of carrying a nuclear payload — over Hokkaido and threatened to target the area around the U.S. territory of Guam with “enveloping fire.” The isolated nation has also said it might test a hydrogen bomb over the Pacific Ocean. In response, the U.S. has sent powerful B-1B bombers from Guam for joint exercises with the Air Self-Defense Force over Japanese territory and the South Korean Air Force over the Korean Peninsula. Those missions have enraged Pyongyang, which views the exercises and flights as a rehearsal for invasion. It says it could shoot down U.S. bombers and fighter jets that fly too close to its disputed border with South Korea. Experts, however, doubt the North possesses the technological capabilities to do so.